This five layer coextruded film offers many outstanding features. The structure is LDPE/EVA/PVDC/EVA/LDPE. FILCON offers a variety of different types of SARANEX™ Barrier Film manufactured by the Dow Chemical Company. Available in widths of 2" to 80" and gauges of .8 mil to 8 mil. Each customer's order is slit and packaged to their specifications. Available in widths of 2" to 80". Corona treatment on one side with roll diameters to 24", on 3" or 6" cores. 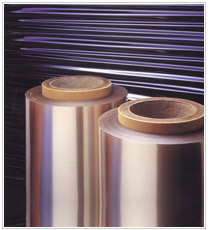 A five layer coextruded barrier film designed for use in lamination applications. It is available in 1.0 mil. A five layer coextruded barrier film designed for use in form-fill-seal pouches and other applications. It is available in 2.0 mil. A five layer coextruded barrier film designed for use in form-fill-seal pouches and other packaging applications. It is available in 3.0 mil and 4.0 mil. A five layer coextruded barrier film designed to replace EVOH. It is available in 4-8 mil..